LAMINATE Flooring High-performance laminate flooring can look like wood or tile. Laminate flooring is extremely durable and easy to clean. Laminates feature engineered, layered construction and can stand up to just about anything. Laminate flooring does not scuff or show wear-through. The surface is burn-resistant and resists scratching from pets. The surface will not indent with normal family usage. The surface will not color fade. Cleanup is easy, requiring only a damp cloth and vacuum. Laminate flooring works well in moisture-prone areas: Kitchens, bathrooms, foyers, family rooms, laundry rooms, offices, and all high-traffic areas. HARDWOOD Flooring Most people prefer the natural, rich beauty of genuine wood floors. Upscale and elegant, hardwood flooring creates a warm and inviting look. Hardwood flooring comes in two categories, solid wood and engineered wood. Solid Wood, the most common consists of solid one-piece boards. Solid wood flooring is usually nailed to a sub-floor of wood. Solid wood is not recommended for basements or below-grade installations. Engineers wood consists of two or more layers of wood laminated together. The top layer is usually a hardwood veneer of varying thickness. The lower layer is a softwood backing. Most engineered wood floors are glued down rather than nailed down. Some engineered wood flooring applications are installed as “floating floors”, meaning the edges of the panels are glued together but not attached directly to the sub-floor. Engineered wood floors can be glued directly to a concrete slab making it suitable for below grade applications. Most wood flooring is available in three formats, with the most common being the the wood strip. Also available are parquet squares or wider width planks. Most engineered wood floors are pre-finished. Unfinished floors installed on-site allow you many choices for types of finishes and colors. CERAMIC AND STONE TILE Flooring Creates an elegant, natural look. Ceramic and stone are almost indestructible, easy to maintain. Ceramic tile can be glazed or unglazed. Stone tiles vary in texture and color for a distinctive look. 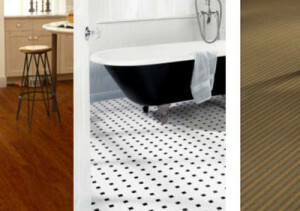 Both tiles are suitable for moisture-prone and heavy-traffic areas such as kitchens, bathrooms, foyers, laundry rooms.